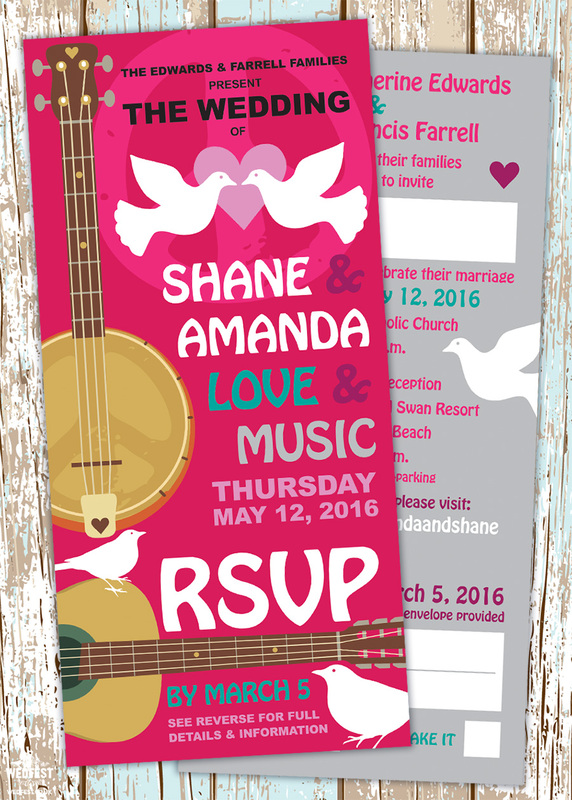 Woodstock Inspired Wedding Invitations – We have been looking forward to sharing this woodstock inspired wedding invitation design for a while now. 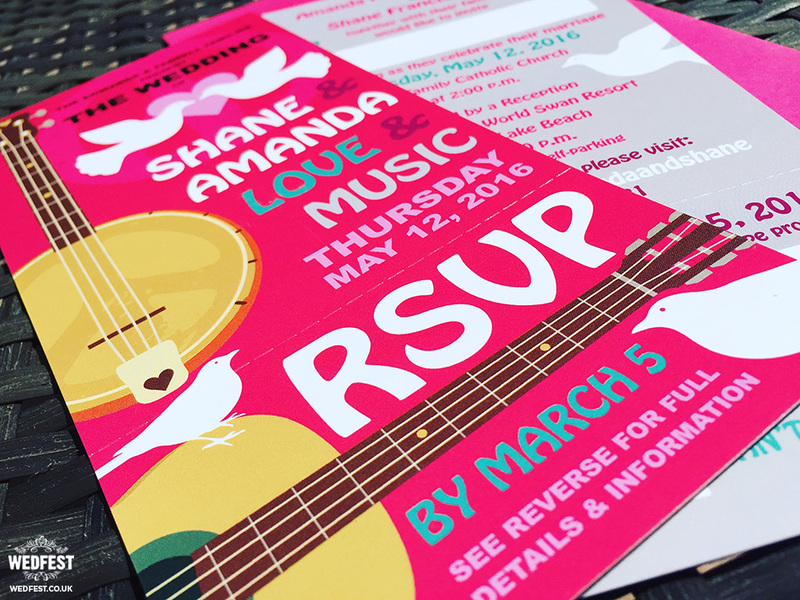 Amanda and Shane from California, USA, got in touch with Wedfest having been impressed with our range of festival inspired wedding invitations. 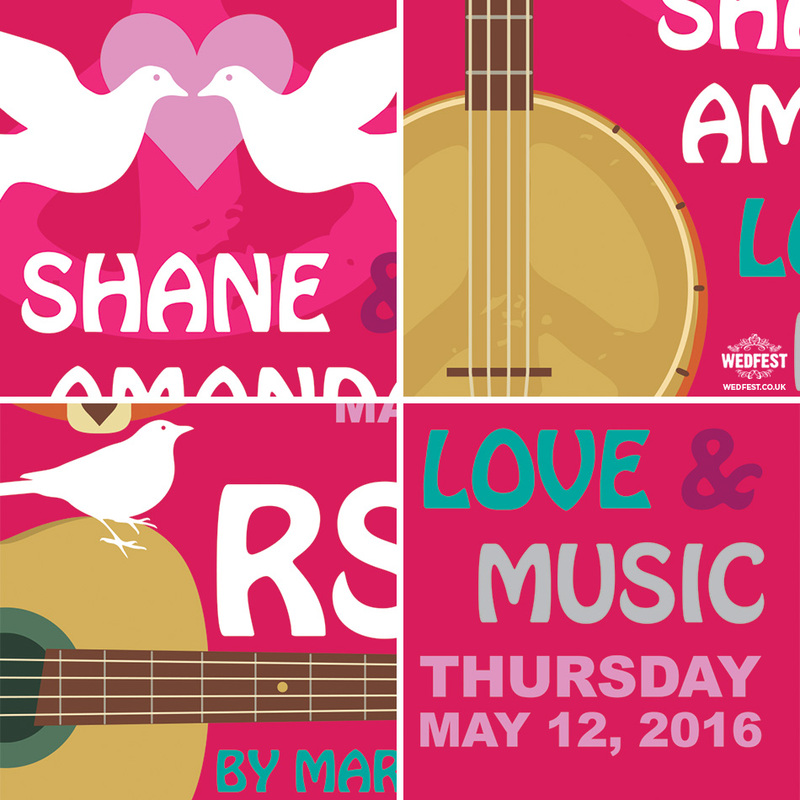 Being musicians themselves and festival fans they wanted Wedfest to create them some fabulous and fun wedding invitations for their forthcoming wedding day. The one thing they said they was that they were more fans of the hippy woodstock festival era than modern day festivals so with that in mind we agreed to work on a wedding invitation design inspired by woodstock festival. 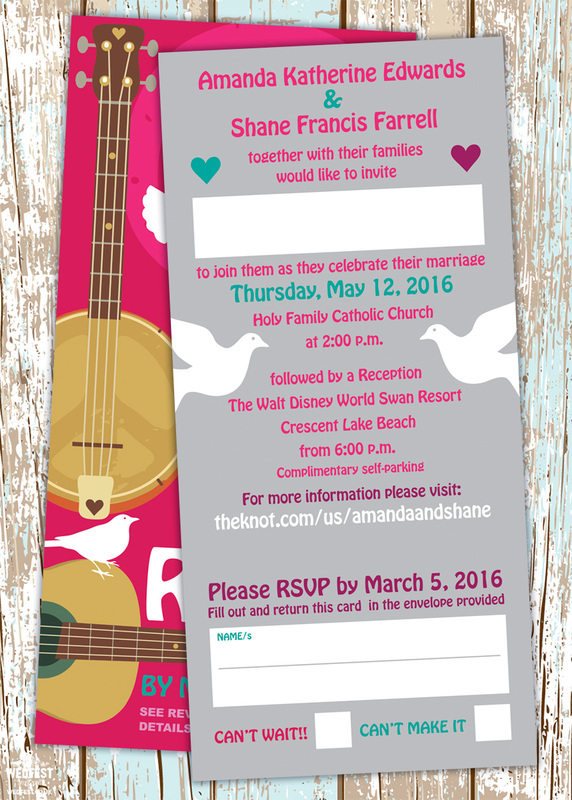 Shane plays the Banjo and Guitar so they wanted us to include these instruments on the wedding invite. Since we were going for a hippy vibe we added a peace sign / CND symbol into the background of the banjo and small love heart details throughout the design. Drawing from the woodstock idea we wanted to include a bird so included some Doves as they are the bird of peace and had 2 doves and a heart at the top of the invitation design. Overall the design turned out really cool and the couple were really happy with the finished result. The reverse side of the invitation contained the full wedding invitation information including information that the couples wedding reception was at one of the parks at Walt Disney World. Does it really get any better than that? The invites were designed in a ticket style so the RSVP at the bottom of the invitation could be easily tore off, filled out and sent back to the couple. 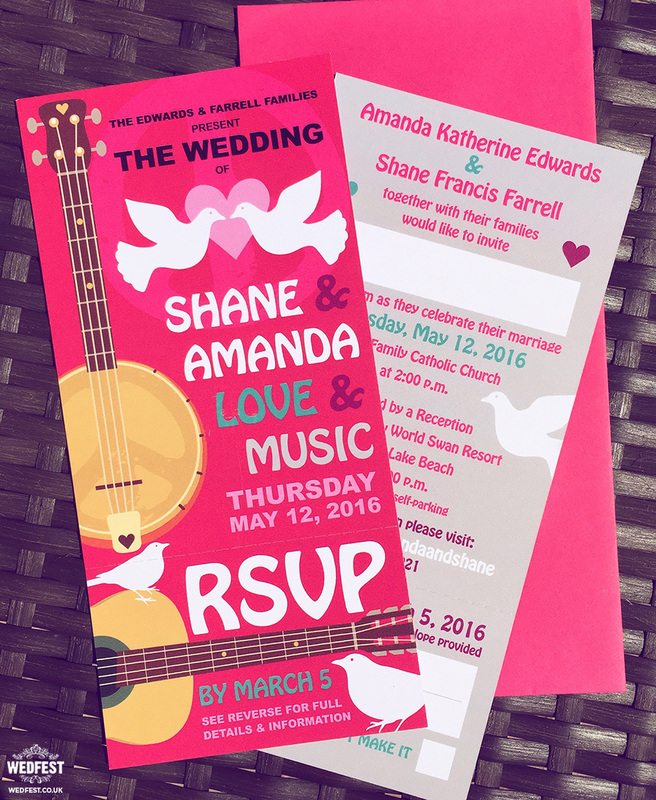 These woodstock style wedding invitations turned out really cool and would be perfect for any couple who are all about peace and love, and music of course. 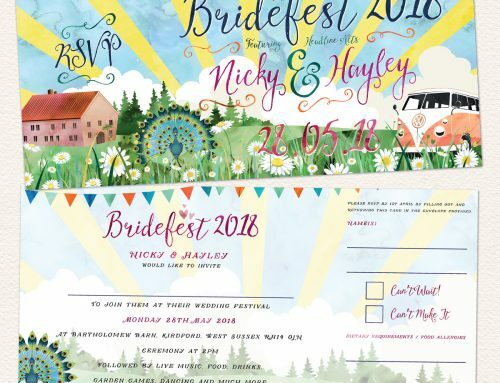 For more information on these wedding invitations or any of the festival or themed wedding stationery you see on this website please click here to get in touch.